Custom Turf is a quality-oriented, locally based Lawn Care Treatment, Ornamental Tree & Shrub Care Treatment, Irrigation, and Landscape Lighting company based in Pittsburgh, PA since 1987. We believe the key to our success and sustainability in the industry has been a direct result of our commitment to excellence. From the moment you contact our office you will receive our undivided attention, and you can rest assured knowing that your needs will always be addressed. We are committed to building long-lasting relationships with our clients. We pride ourselves on our strict attention to detail and our comprehensive knowledge and, as such, our number-one goal has been, and will always be, to provide our customers with only the best experience and the most beautiful lawn and landscape. We are Grass Cutting, Mulching, Leaf Removal, and Light Lanscape professionals! As the recognized leader in environmentally responsible lawn care services, our approach is safer and more effective than traditional chemical services. Our NaturaLawn of America lawn care programs are customized to the needs of each individual lawn. We work with your complete yard environment to create a naturally healthy lawn that stays that way. Clean Air Lawn Care Pittsburgh is a full-service sustainable and organic lawn care company for residential and small commercial properties. By working with Clean Air Lawn Care Pittsburgh you choose a lawn care service that is professional and cares for the health of your property, family and our environment. Our team is formed by "true believers" that promote sustainable practices with solar-powered lawn mowers and organic fertilizers that are safe for kids and pets. We work with the unique needs of your yard to bring you the most beautiful and healthiest lawn in the neighborhood. Contact us for a free estimate and let us show you how your lawn can look amazing the natural, chem-free way! Quality flowers/plants from our greenhouses and fresh veggies picked from our fields! New Lawn provides weed and fertilization services to the Beaver, PA area. Diamond Cut Landscaping Service specializes in lawn care and personalized landscape designs, using your favorite shrubs,trees and flowers.We will give your lawn a well manicured look. Each lawn care visit includes mowing, edging and trimming of all turf areas. With edging, we remove the grass that grows over patios, sidewalks, driveways, and walkways due to the buildup of soil deposits at the edge of your lawn. In the areas our mowers cannot reach, we trim the grass to the same height the mower would have. Finally, we remove all the clippings from the sidewalk, curb, driveway, and patio and dispose of all debris. Our staff is courteous and reliable an we also give free estimates. Boughter’s Lawn Care Services is dedicated to excellence in service, integrity in operations and reliability to customers. In other words, no corners will be cut, no unnecessary services will be performed and I will be there when I say. Let me treat your lawn as my very own. A picture of my lawn. I currently offer professional lawn mowing, which includes trimming and blowing hard surfaces clean, minor landscaping and full-service lawn fertilizing, including the control of insects and weeds. I am licensed by the Commonwealth of Pennsylvania Department of Agriculture for pesticide application and I am fully insured. 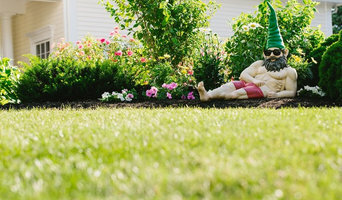 Unique Lawn Care, located in Kittanning PA specializes in lawn care & landscape maintenance proudly serving all of Armstrong county communities and most surrounding regions. We handle all sizes of lawns and landscapes from the smallest yard all the way to commercial and government properties, and everything in between. Our outdoor power equipment service personnel can maintenance and repair your outdoor power equipment. We service all brands of equipment and have a selection of new outdoor power equipment for the residential and commercial user. We carry only professional brands like Shindaiwa, Earthquake, Kohler, and Oregon. Call us today to see how we can help!! Grago Lawn Care strives to understand what its clients want – healthy, beautiful lawns that they can boast. In order to achieve this goal, our experts approach each lawn differently, since conditions can differ widely from one property to the next. Proper fertilization and weed control services take into account whether your lawn is situated in the sun or the shade, the type of soil on your property, and numerous other factors. That is why we work together with our clients to develop tailored fertilization and weed control programs for each individual lawn, which stand to generate the best possible results. Nemeroff Law Firm provides the kind of service that asbestos victims need. Their national trial lawyers have battled big business for years to collect damages for the victims of asbestos negligence. Together, the firm has more than 150 years of legal experience, a priceless asset for their clients. Their legal expertise is matched only by their compassion for the victims and their families. The Nemeroff Law Firm has a sterling reputation throughout the nation for good reason. In the last several decades, their lawyers have won hundreds of millions of dollars for their clients. Their success is due in large part to the expert support team they have assembled, which includes legal and medical investigators and expert witnesses. In addition, they use the latest technology to ensure their clients get the greatest financial reward. Verdicts in the last decade include two $12 million awards in Louisiana, a $10 million verdict in Pennsylvania, and another $10 million award in New York. The firm is a member of American Board of Trial Advocates, Million Dollar Advocates Forum and numerous state bar organizations, including Utah, Texas, Pennsylvania, Arizona and Louisiana. They are positioned to serve clients in a number of locations throughout the United States. We Provide Honest, Quality Work at Affordable Prices! KMK Landscaping prides itself on providing customers with the highest quality work we can do using the best possible equipment and materials available to us! We want you to be thrilled by the time we are done with your property and we aim to please all of our customers! Why should I hire a Wexford, PA lawn care services company? Lawn care services in Wexford, PA will be able to maintain large lawns by installing sprinkler systems for you and carrying out lawn treatments to keep your grass healthy and green. If you have a particularly large outdoor space to tend to, it could be worth hiring a Wexford, PA groundsman to come and weed your lawn, remove moss and care to your sprinkler system on a regular basis. However, for most of us this probably won’t be necessary, but it doesn’t meant that you won’t need a lawn care professional at some point. For example, when planning a garden makeover you may need their services if you intend to include a patch of grass in your garden design. Lawn specialists can lay new grass and advise you on new lawn care so that you can keep your patch of grass, no matter how small, healthy and green for as long as possible. Or, if you inherit a lawn from a previous owner but aren’t sure what to do in the colder months, speak to Wexford, PA lawn care services about winter and autumn lawn care. You may find that the groundsman or lawn care services professional you speak to also works closely with Wexford, PA landscape gardeners who can help you with more aspects of your garden renovation and sprinkler system. Here are some related professionals and vendors to complement the work of lawn & sprinklers: Landscape Architects & Garden Designers, Landscape Contractors, Garden & Landscape Supplies. Find a lawn and sprinkler specialist on Houzz. Narrow your search in the Professionals section of the website to Wexford, PA lawn care services, groundsmen and sprinkler system companies. You can also look through Wexford, PA photos to find examples of lawns and sprinkler systems that you like, then contact the Wexford contractor or groundsman who worked on them.